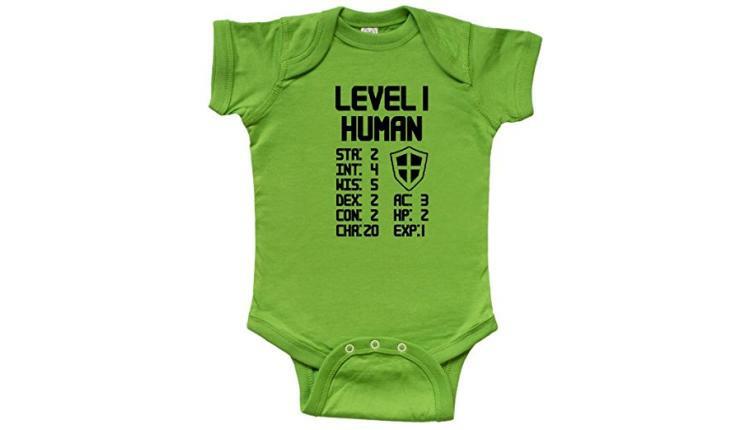 Looking for nerdy baby clothes for the newest addition to your family? We’ve got you covered. Let’s face it: we’re definitely not kids anymore. Where once we had Saturday morning cartoons and AIM, we now have HBO and a Facebook feed full of engagement announcements and baby pictures (so many baby pictures.) Hell, some of us even have kids and spouses ourselves! So, with the onset of this information and any quarter-life crisis it may have triggered, it’s time to pass the torch to the next generation and start these kids off right — the nerdy way! Here is our list of the top 21 nerdy baby clothes and gifts for the next generation that will have any nerdy parent, grandparent, aunt, uncle, or friend going ga-ga (goo-goo). What could possibly be more fun than hopping around on top of one of the Great Old Ones? 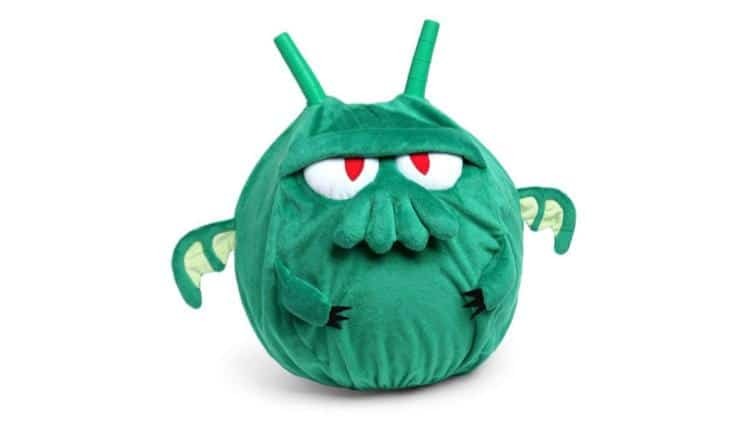 This Cthulhu Hopper Ball by ThinkGeek is the perfect way to gently introduce your kids into the Lovecraftian mythos. Harkening back to the 70’s and 80’s, this redesigned “hippity hop” is certain to provide kids with hours entertainment, and may just even continue Cthulhu’s promise of driving those who look at it mad. This disgruntled-looking ball of unspeakable horror arrives deflated, and measures approximately 13″ in diameter when fully inflated. It comes with an air pump (isn’t that nice?) and is surface-washable in case your kids have a little too much fun (and throw up). The inflatable ball interior is covered with a plush polyester skin, making this hopper equally cuddle-able as it is terrifying. Being a baby is hard. You’re just chilling somewhere safe and warm for 9 months, and then WOOSH (sound-effects are totally accurate) out you come into a world of bright lights, loud noises, and a ton of alien people you don’t know pressing in to get a good look at you. Sometimes, it gets to be too much. Sometimes, a baby just needs some space! 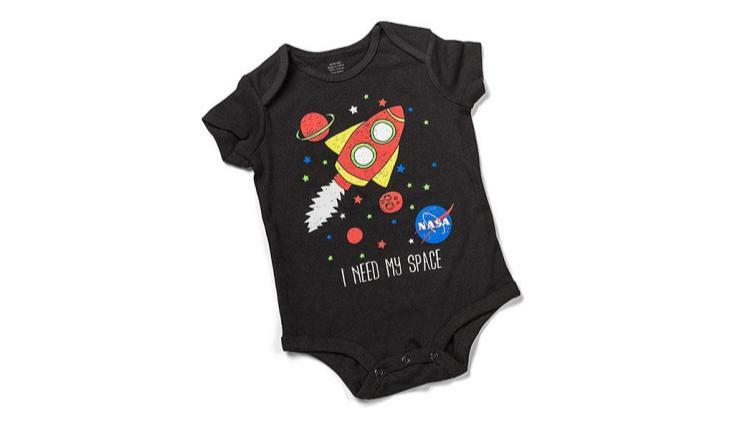 This NASA inspired onesie will help convey that need, even though your baby can’t talk yet. Made from 100% tag-less cotton, this onesie features short-sleeves and three-snap closure at the bottom for easy fastening. Printed on the front is an out-of-this world design, including a red rocket ship and the NASA logo. Get your little one interested early, and help them reach for the stars (from a respectful distance until they start crying). 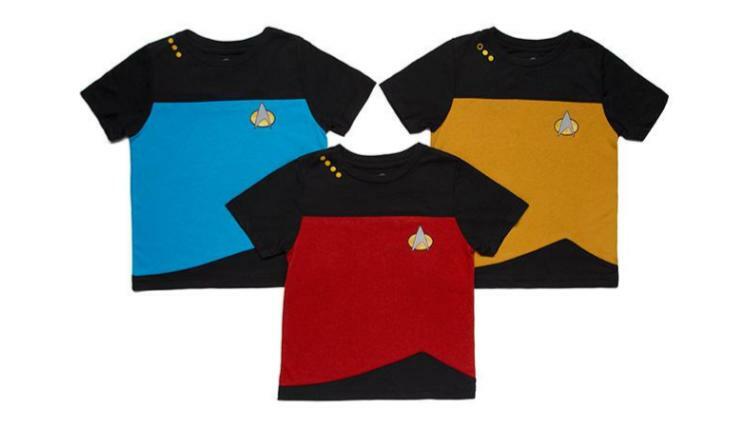 Get your next generation interested in the Next Generation with these awesome Star Trek: The Next Generation Uniform shirts from Mighty Fine. Help your kids pursue a career in Sciences (blue), Operations (yellow), or Command (red), so they can go boldly where none have gone before in exploration of this vast and alien world they exist in. This shirt is typically available in sizes 2T – 4T in each colour, and is made from 100% cotton. Detailing includes the Comm badge on the left breast and the naval pips along the collar in black outlined, shimmering gold and silver. Washing instructions for your Starfleet uniform suggest cold machine wash and flat lay-out to dry to ensure that they remain up to regulation. Who knew such a fierce hero could be so darn cute? This 8″ tall plush by FunKo is sure to make any Black Panther fan squeal, no matter what age they are. 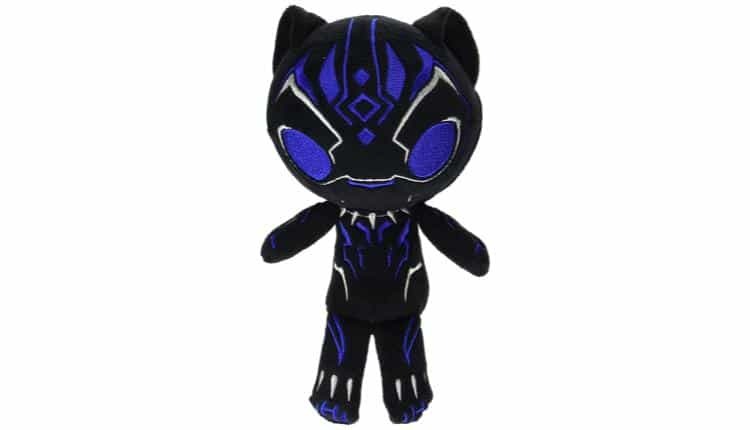 Featuring the suit design from the Black Panther movie complete with blue/purple vibranium markings, this plush is the perfect cuddle-able companion for any aspiring Marvel fan. Give this Black Panther plush to your favourite kid when they need someone to protect them from nightmares, or even just as a side-kick to their own superheroing. The small size and soft exterior make it the perfect accomplice for all those daring missions to reach the top-shelf cookie jar. Pokèmon is one of those franchises that seems to have kept up with the generations, and is still incredibly popular today! 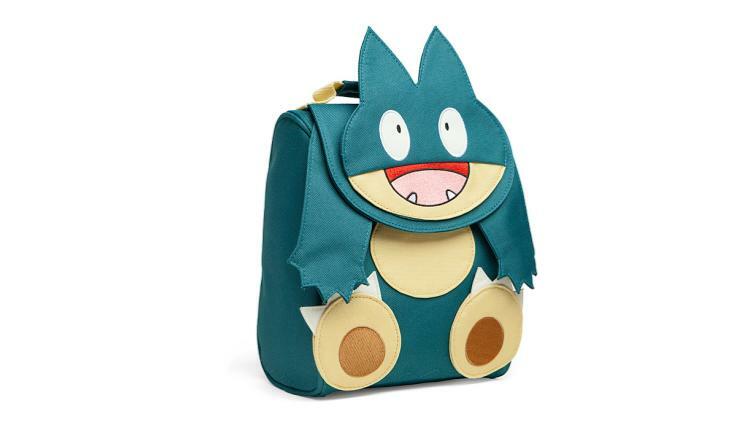 Whether it’s a parent’s Indigo League nostalgia or a child’s wide-eyed excitement at catching their first Caterpie, now both can be celebrated every lunchtime with this Munchlax lunch box from ThinkGeek. This cream and teal canvas lunch kit measures 9 ½” x 7 ½” on the outside, and its main compartment measures 9″ x 7″. Two Pokèball zipper tags mark the way into the spacious main compartment, and a card-carrier beneath the main (head) flap makes sure your child can be reunited with their lunchkit if ever they lose it. Finally, a handle behind Munchlax’s head makes carrying a breeze! The exterior and interior are both made from 100% polyester, and should only be spot-cleaned to maintain its dashing good looks. Sometimes, the only thing that helps the parents of a teething baby is just a moment to recuperate some HP. 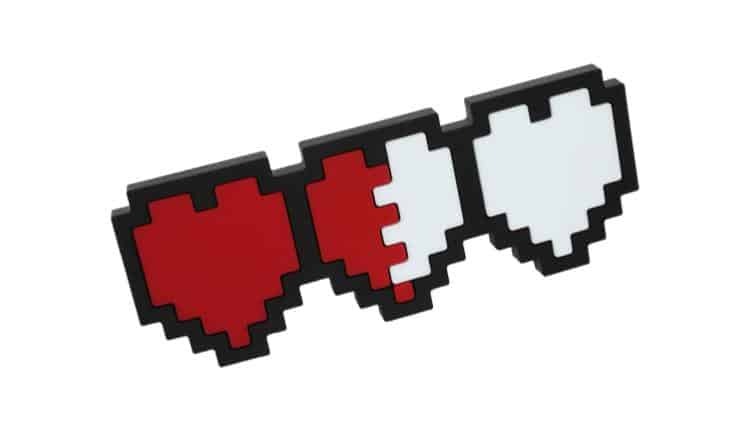 Designed for ages 3 months and up, this pixilated heart container teething toy, stylised after those found in the original Legend of Zelda series, will be a lifesaver for sure. Catch a moment to take that health potion, while your suffering little one gnaws on this food-grade silicon teether. When they’ve drooled on it or tossed it on the floor enough for your liking, you just need to toss it into the dishwasher for it to be just like new again! (Well… Maybe a few teeth marks). Finally, Mike Wazowski can get the spotlight he deserves with this adorable bib and hat set from BoxLunch. This cotton bib and cap set will make sure your little monster stays warm and clean during feeding times, or even just out and about. 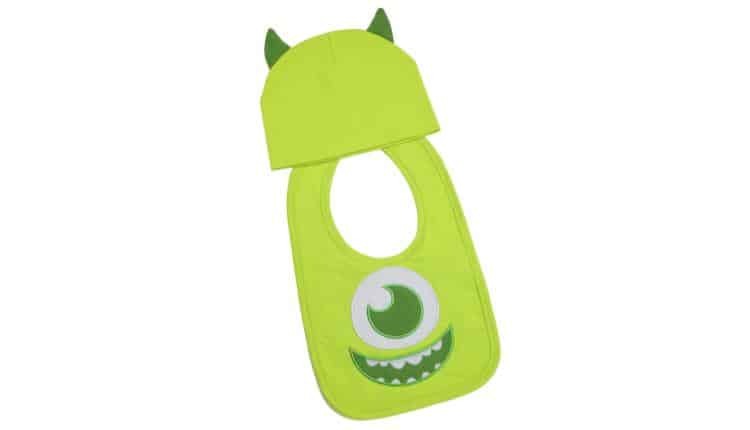 Featuring Mike’s iconic cyclops eye and toothy grin on a lime green background, the bib secures with velcro tabs for easy on-and-off. The cap has Mike’s little devil horns atop it, ensuring that everyone knows just how impish your bundle of fright joy is. This bib and cap set is perfect for the Disney/Pixar loving parent who want to reminisce about Monster’s Inc., and for kids who are or will be interested in the much newer Monster University. Have you ever seen an article of kid’s clothing, and wondered where the adult sizes were? 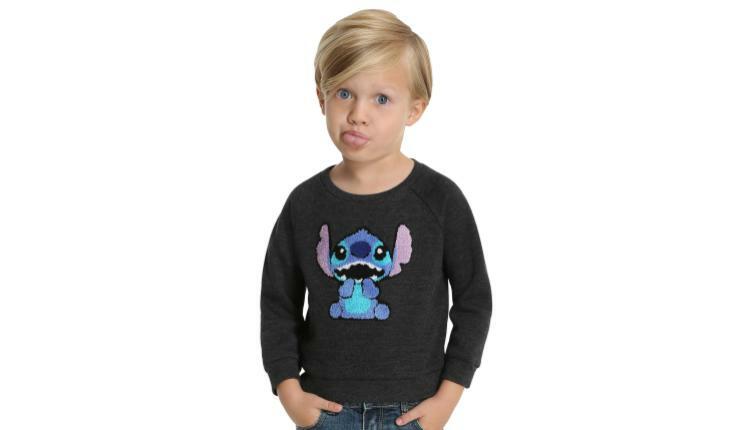 Well, that’s what we think of this fuzzy Lilo & Stitch sweatshirt from BoxLunch. Featuring the ever lovable Stitch on the front in a cute and fluffy chenille patch, this grey pullover is available in sizes 2T – 6T, and is made from a soft poly-cotton blend. Introduce your little one to this lovable experiment, the meaning of “ohana,” and all things Elvis-related with this sweatshirt. Your Disney addiction will know no bounds, especially when it comes to your kids! You’ve got an excuse now, after all. Heartstrings everywhere were pulled on when Blizzard released the origin story for Mei from Overwatch. 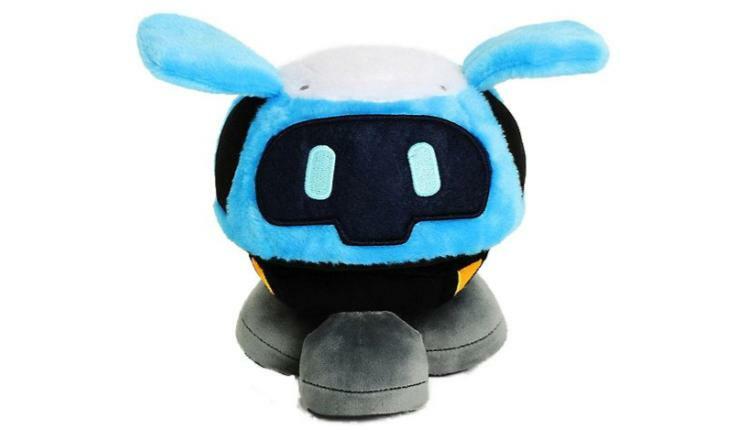 Besides her sweetly nerdy disposition and Snowball’s adorable chirping, Mei’s stasis and Snowball’s sacrifice were enough to make the plucky little weather drone a fan-favourite. Being super takes a lot of work – and definitely work up your appetite! Feast your eyes on this colourful Teen Titans Go! toddler tee and chow down on adorable chibi snacks with Robin, Beast Boy, and Cyborg. Your littles can rock this awesome tee and get their recommended daily intake of nerdery all in Go! This blue-background tee is made from 100% cotton, with a vinyl print on the front. It’s typically available in 2T – 6T, but they’re going fast! Get yours before they’re gone! Studio Ghibli is a part of a lot of our childhoods. Miyazaki brought wonder and fantasy to our lives with his amazing animated feature films, while simultaneously teaching us morals and scaring the hell out of us (if we watched it too young). Now, you can bring some of that same adorable freakiness into your own child’s life with this glow-in-the-dark coin bank from Entertainment Earth. Perfect for any woodland-themed nursery or child’s room, this little coin bank brings the ethereal Kodama forest spirits right into your home. 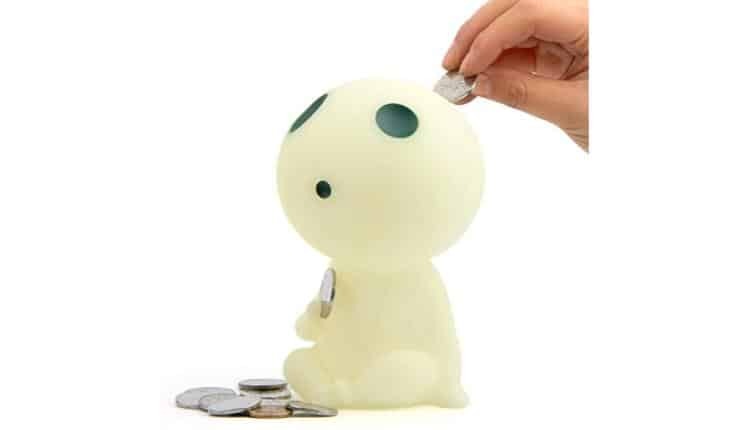 This resin Kodama coin bank fits comfortable on top of a dresser or shelf. The money slit is in the back of the little sprite’s head, and there is an twist-and-release stopper at the bottom for ease of access. What’s more, the little spirit can even hold a coin in its hand, perfect for Tooth Fairy money or other monetary surprises! Paw Patrol is one of those shows that your kids can watch over and over again without tiring. Much like how we watched some of our favorite childhood television shows. There are tons of awesome Paw Patrol toys available in 2019. And now, your pup-loving little one can ride in style on this 12″ starter bike from Target. 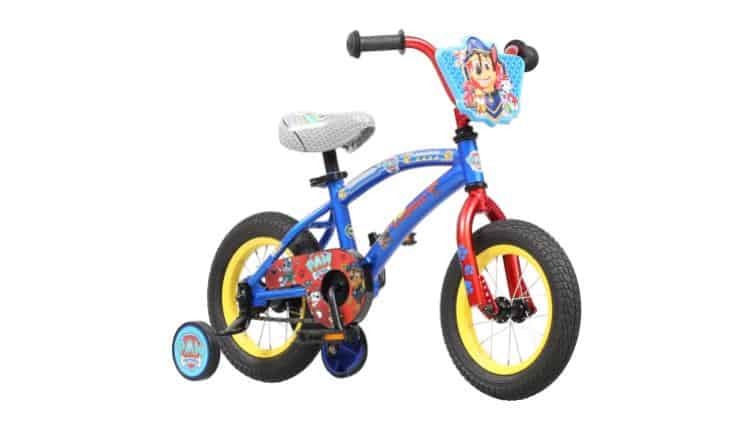 Designed for new riders in mind, this bike features removable training wheels, coasting brakes, and a sturdy steel frame. This bike is decked out with thick, inflatable wheels and emblazoned with Paw Patrol imagery, including a shield across the handlebars. The prominent figure is Chase, but the bike features the rest of the team, too! This bike is recommended for ages 1 year and up. When your kiddo levels up their “ride bike” stat, the adjustable seat and removable training wheels make it easy to transition to the next stage in riding. It’s never too early to apply to Starfleet. 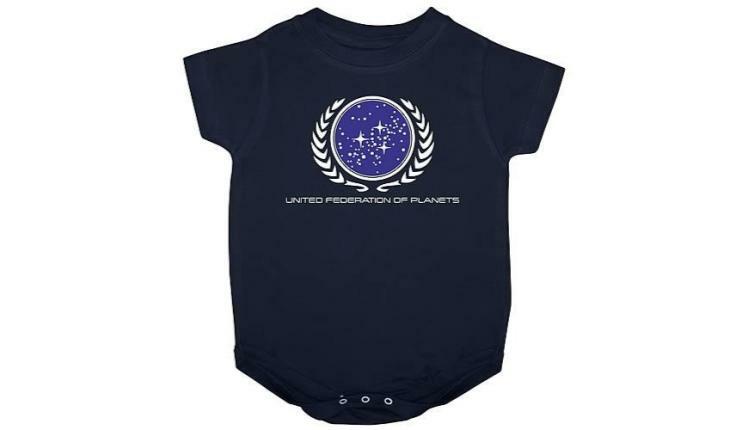 With this adorable navy blue onesie from Entertainment Earth, you can display your baby’s inclusion in the Federation (doubles as protection from passing Romulans.) 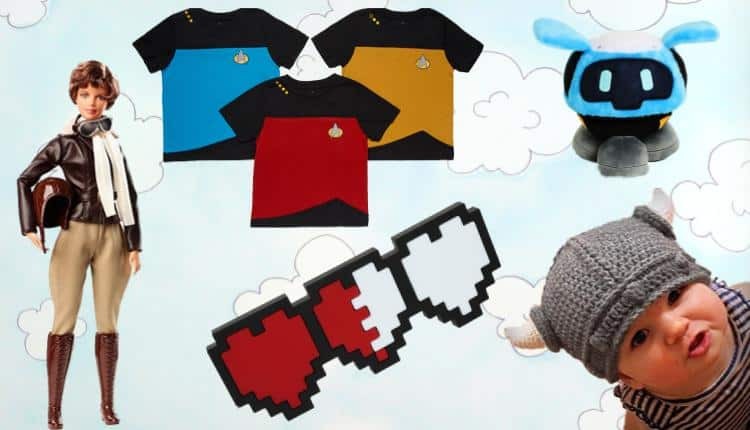 This outfit is perfect to show off your Star Trek pride at cons, family gatherings, and everyday outings. This snap-bottom onesie is typically available in 6mo – 18mo sizes, and is made from 100% machine washable cotton. The onesie features the Federation insignia of the chest, complete with twinkling stars and laurels, along with the caption “United Federation of Planets” for those who don’t recognise the symbol on sight! One of the best things about 2017 was the uptick in strong female characters for girls and women to see as role models. Wonder Women was one such source; it was a film that had reviewers raving, and smashed through the box office to become the highest grossing superhero origin story. 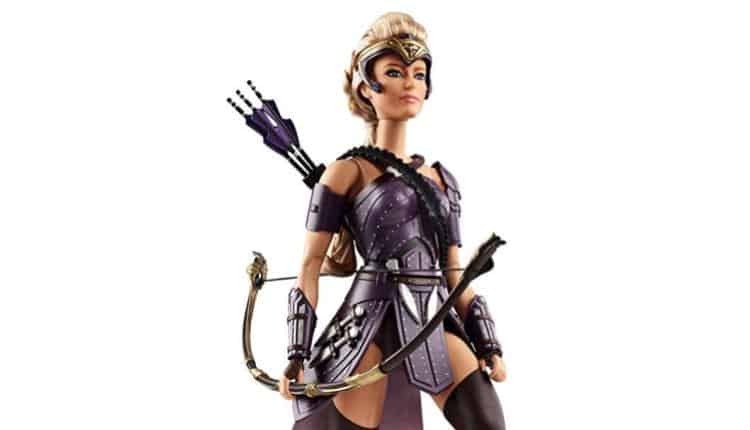 Now, with Wonder Woman 2 set to come out in December 2019, you and your kids can nerd out together with this awesome, fully articulated Antiope doll from Mattel. This doll is designed after Robin Wright’s character Antiope from the Wonder Woman film. She comes combat-ready with Amazonian armour, bow and arrow, and her armour is removable, so she can be adorned in other clothing as well. Perfect for Barbie collectors of all ages, whether you keep her pristine in the box, or have her teach your child’s other dolls combat rolls. Give your baby a boost on all the places they’ll go with this Dr. Seuss inspired nursery set by Trend Lab. Featuring a number of lovable Dr. Seuss characters, this bright, colourful set spells out the letters of the alphabet to help set your little one on the path to early literacy. This nursery set includes a reversible 35″ x 45″ quilt, a 100% cotton fitted crib sheet, which features typography from everyone’s favourite Dr. Seuss titles. It fits a standard 52″ x 28″ crib mattress with 8″ deep pockets and a wrap-around elastic for a secure fit. The set also includes a colourful stripped box pleat crib skirt with a 15″ drop, perfect for adding that finishing touch to your crib. Want to keep up the Dr. Seuss flair? 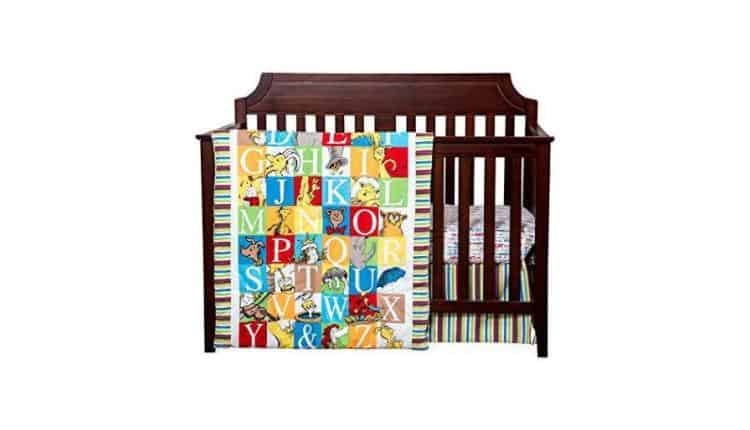 You can also get a Dr. Seuss ABC crib bumper, growth chart, and storage tote. 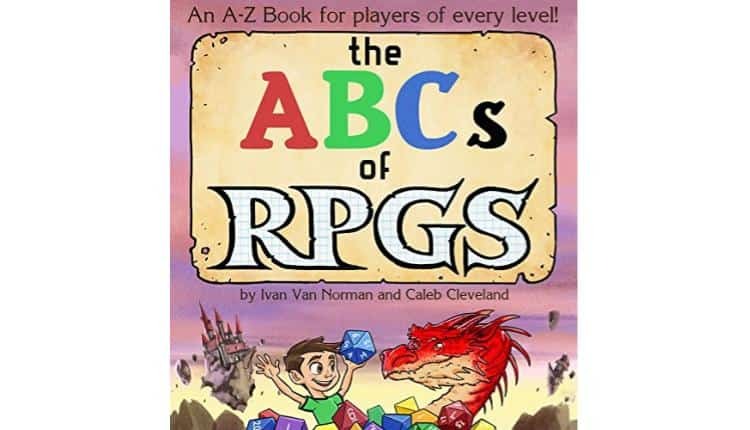 Get ready to level up your little ones with this fantastic ABC book for geeky kids and parents alike! Originally a Kickstarter campaign, this 28 page fully illustrated children’s book helps teach the alphabet in the best, nerdiest way possible. Full of clever rhymes and diverse illustrations of adventurers and monsters alike, this hardcover book is sure to become a family favourite. Teach your children their ABCs by showing them that everyone can be an adventurer, with the help of books that tell of fantastical creatures and dice rolls. We have four words for you, nerdy parents: Tiny. Crocheted. Viking. Helmet. That should really be all the incentive you need to get this adorable handmade cap for your littlest warrior. 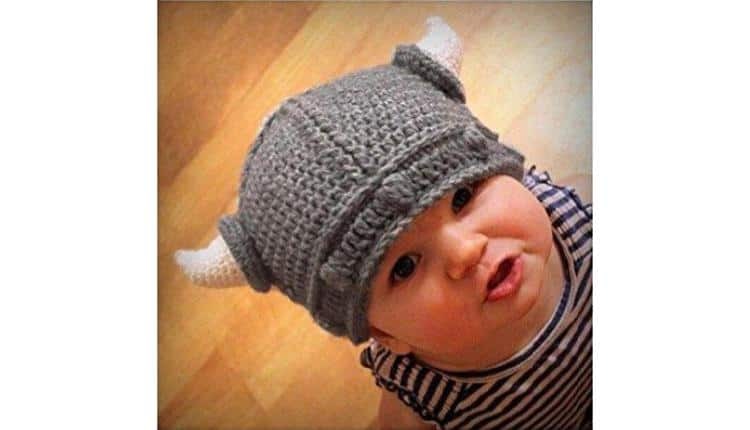 Made for babies and toddlers, these unisex crocheted viking helmets come complete with tiny horns. Get an adult beanie for yourself and arrive at your next Gathering in style. The baby/toddler cap measures approximately 14″ – 15″ in circumference, while the adult beanie measures 19″ – 20″ circumference. Both beanies are made from a stretchy woollen fibre, which means it’ll be super soft against your and your little one’s heads. We all know that learning another language works best when kids are young. So, what better way to teach your little nerdlets a new language that will wow and shock their school teachers than with these oversized Klingon language magnets? These magnets help to teach your burgeoning Trekkie tlhIngan Hol (Klingon language) using these handy pIqaD (Klingon letters). These magnetic characters come in a variety of colours, and their large size is perfect for little hands to pick off your ship’s hull or kitchen refrigerator.The set includes a total of 48 characters, each of which are approximately 2″ tall. There are also duplicate characters for repeated use, and apostrophes for even more advanced grammar. 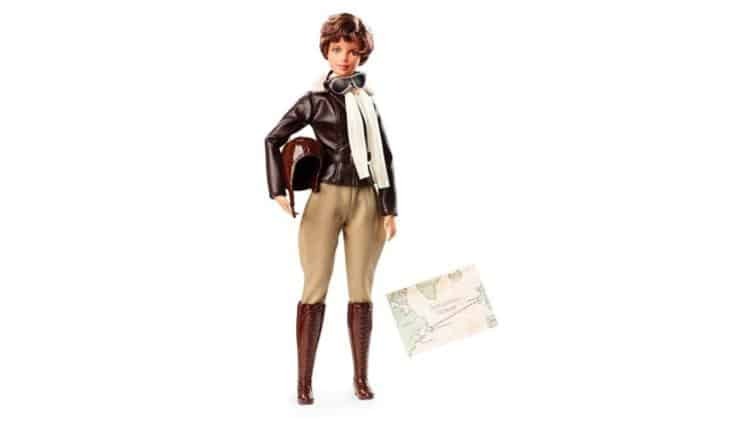 When Barbie® announced that they were creating a line of dolls based upon inspirational women as part of their #MoreRoleModels campaign, many women rejoiced. Finally, a doll that would provide a starting point for parents to talk to their kids about female role models, one which would show children, and little girls especially, that women could do and be anything they set their mind to. So far, the Inspiring Women collection only has three dolls available for purchase, however they’re due to release a total of seventeen dolls that showcase many diverse women from all walks of life and careers. Amelia Earhart (shown above) is, of course, an American pilot famous for disappearing over the Pacific Ocean in 1937. Hundreds of stories circulate about her disappearance, however her most notable achievement are those she made as a pioneer of aviation. Earhart was the first female pilot to fly solo across the Atlantic (which she did successfully in 1928), along with a number of other early aviation records. If planes aren’t your kid’s thing, the Inspiring Women line also features celebrated Mexican artist and feminist Frida Kahlo, and African-American aeronautic mathematician and physicist Katherine Johnson. Keep in mind though, that the demand for these dolls is, understandably, very high. They are flying off the shelves, both virtual and physical. Get yours while you can. This poly-cotton blended unisex onesie is brought to you by Inktastic. It is available from newborn to 24mo sizes, and in a plethora of colours, ranging from this stunning green to heather and navy, to black. Re-enforced snap-bottom closure allow for quick and easy diaper changes when your baby does a loot drop, and a flexible neckline gives you +1 to your grapple check the next time you need to change baby’s clothes. As mentioned above, 2017 was a great year for female role models in media. 2018 seems to be continuing that forward motion with the release of Black Panther, which boasts a primarily African-American cast. Among that star-strewn cast is the incredibly talented Lupita Nyong’o, who plays the badass Wakandan spy Nakia. No Black Panther action figure set is complete without this headstrong War Dog, and now you and your kids can include Nakia in yours with this Marvel Legends fully-articulated figure. 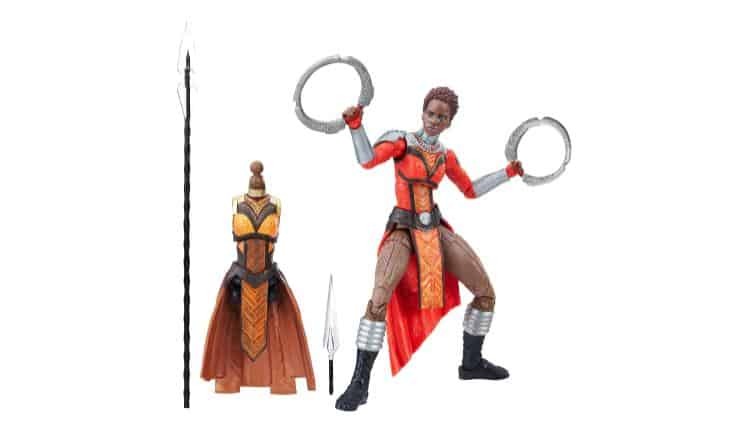 This 6″ Nakia figure comes with two costumes that she can change into, along with a bladed spear and ring blades. Her articulated limbs make her fully posable, and the careful detail is reflective of Ms. Nyong’o’s portrayal of her in the movie. Kate's geek love started at a young age with Harry Potter, Pokémon, and Marvel cartoons. Some of her best childhood memories involve watching Star Trek: Voyager and Stargate SG1 with her dad. As she got older, her geekery progressed into the gaming sphere through D&D, and through video games including Dragon Age, Mass Effect, Bioshock, Alice: The Madness Returns, and The Witcher 3.